Over 700 persons work at Sisu Diesel factory in Nokia, Finland. SisuDiesel engines are manufactured also in Brazil primarily for South American markets. Over 60 years of engine construction has resulted as high technology, which can be seen both in products and in production. Throughout its history Sisu Diesel has developed many innovative technical solutions which have not been introduced by our competitors until 21st century. For example direct injection technology, cross-flow cylinder head, centrally supported cylinder liners and advanced turbocharger technology have been everyday features in SisuDiesel engines already for decade. 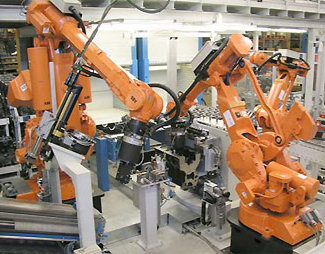 Uncompromising professional skills - The assembly of basic engines as well as the painting of complete engines is handled entirely by robots. The final installations and inspections are made by skilled professionals. Quality and environment systems are certified according to the ISO 9001 and ISO 14001 standards. Engines for demanding marine use - The basic construction of the SisuDiesel engines has been designed for extreme conditions – from blistering equatorial heat to the harsh winters in Northern Europe. A growing number of manufacturers are choosing reliable SisuDiesel engines to power their advanced machinery and equipment. Quality materials and advanced manufacturing processes ensure excellent reliability. That‘s why custom made SisuDiesel marine engines propel all kinds of watercrafts reliably on all seas throughout the world. Strong and reliable marine engines in power range 130 – 410 hp - Citius series 4 and 6 cylinder marine engines have been constructed for use where reliability, low operating costs and easy servicing are the most important features. When classic sturdy basic construction is combined with new generation control electronics and modern injection system, the result is a SisuDiesel engine that meets even the most demanding user needs. Four valve cylinder head - Citius series marine engines feature a four valve cylinder head. This facilitates injector arrangement between the valves in the middle of the cylinder while the combustion chamber is on the piston top. Two inlet and two exhaust valves with their own ports improve gas exchange. The fuel mixes better with air, which results as reduced emissions and improved fuel economy. In addition better gas exchange reduces heat load in the cylinder area. 44 CTM-2V –motor still has cross-flow two-valve head. Also there have port design and valve timing been optimized for emissions and fuel economy. Centrally supported cylinder liners - Citius series marine engines have centrally supported cylinder liners. This feature is unique for an engine of this size, but already traditional for SisuDiesel. When cylinder liner vibration is reduced, cooling becomes more effective, cylinder liner and piston ring wear as well as oil consumption are reduced, which results as longer engine life. Common Rail injection system - SisuDiesel marine engines use Common Rail injection system, which allows considerably higher injection pressure than before. In addition the control unit adjusts the injection pressure to optimum in all situations – it is high already at low engine speeds and at high speeds it is limited to adequate value. Electronic control enables injection even at five different stages during the combustion process. The control system analyses and adjusts the fuel quantity to engine up to over a hundred times in second. Sequential injection is one of the most significant factors in reducing emissions while keeping the fuel economy as good as possible. Third generation engine control electronics EEM3 - The third generation electronic control system developed for Common Rail engines offers very versatile features for user’s benefit. Bosch supplies common Rail components and basic program ware; SisuDiesel develops motor specific SisuTronic control program, though. The whole injection process is totally controlled, e.g. injection advance is adjusted to optimum depending on conditions. The advance has an essential effect on emissions. Cold start and cold running adjustments are controlled automatically depending on ambient and engine temperatures. Starting is good with only slight smoking. Electronic engine protection functions are built into the control system. The system analyses constantly possible injector faults, rail pressure and operation in every cylinder. More enjoyable sound - In Citius series marine engines the combustion pressure rises slowly thanks to pre-injection and does not cause typical sharp diesel sound. So the running sound of Citius engines is smooth and pleasantly low. The new timing gear profile on Citius series is also reducing mechanical sound significantly. Lower noise level offers more pleasant environment on the watercraft. Easy servicing - The motor has a clean-cut construction and service points are easily within reach. For example fuel filters can be changed quickly without tools and fuel spill. Spare parts are highly standardized between various engine types, which makes spare parts service and service labour rapid. 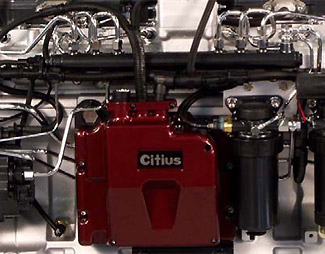 An EEM3 service tool has been developed for Citius series engines. It is a Windows based special program that makes reading fault codes and engine running history and reloading of new programs easy.